On International Human Rights Day, December 10, 1978, I embarked on a Special Ministry of Justice and Peace and opened the Capitol Hill office of the Irish National Caucus. 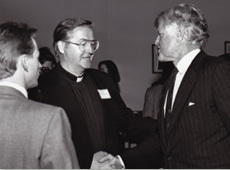 Ecclesiastically, it was the first of its kind, and also the first and only Irish office ever opened on Capitol Hill to lobby for justice and peace in Ireland (and, of course by that term, I mean all of Ireland, particularly The North/Northern Ireland). 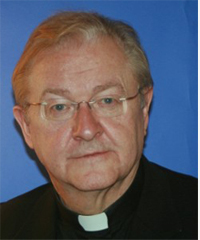 As a Catholic priest, my work had to be based not only on secular under- standing of human rights, justice, and peace but also on Catholic social teaching. 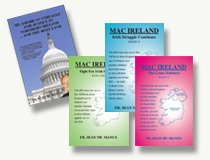 I was conscious, therefore, that I had a double struggle ahead of me: (1) explaining the basics of England’s injustice in Northern Ireland/The North: and (2) reminding Irish-Americans that “working for justice” is not only the patriotic thing to do, but it is also an essential part of the Catholic faith . Irish Americans needed such remind- ing about their faith because, as the expression has it, “Catholic Social Teaching is the best-kept secret of the Catholic Church,” (and that expression was coined not by church opponents, but by American church leaders themselves). I also knew that even those very knowledgeable of Catholic social teachings, like many priests, nuns, bishops, and theological experts, never somehow applied it to Ireland: to Latin America, South Africa, etc., yes, but never to Ireland. Just like in secular America, many leading experts and politicians never applied fundamental American foreign policy principles to Ireland: principles like national self-determination, respect for human rights, non-discrimination. It appeared there was a conspiracy of silence between church and state regarding England’s injustice in Ireland. The word “constitutive” means that without which something will not stand. So, without justice, the Gospel of Jesus Christ, the New Testament, and the Catholic Church do not stand. special ministry, for which I thank God every day. “Justice in the World” makes it clear that we are here on this earth to worship God, preach the Gospel in word and deed, and build up God’s kingdom on earth in truth, justice, love/solidarity, and freedom. State-sponsored (to use a modern term) racism/sectarianism, the flip side of the same coin, are the historic twin evils of the world. It is upon these twin evils that the British Empire was built, including, of course, the long genocidal and ethnic cleansing conquest of the entire island of Ireland, England’s very first oppressed colony. Racism/sectarianism were also the foundation stone of Northern Ireland in 1920. In this context, racism equals anti- Irish, and sectarianism equals anti- Catholicism. Now that the context has been set let me continue with the overview of Catholic social teaching. Modern Catholic social teaching, of course, began long before 1971. This teaching is considered to be the corpus of Catholic social teaching contained in official Papal and hierarchical docu- ments, commencing in 1891 with Rerum Novarum (“The condition of Labor “) by Pope Leo XIII, right up to the present time. “Social justice” has been mainly a reli- gious concept in that it emerged from re- ligious circles. It covers the just and fair relation of the individual to society. participation and society has the obligation to order its institutions so that such participation is possible. The actual term “social justice” was first coined by a Jesuit priest, Luigi Taparelli d’Azeglio, in 1843. It was first mentioned in Papal teaching by Pope Pius XI in his Encyclical, Quadragesimo Anno (1931), issued to commemorate the 40th anniversary of the previously mentioned landmark Encyclical,”Rerum Novarum.” by Leo XIII (Full disclosure here: I have issues with this great pope because the British government got him to condemn the Irish Plan of Campaign, 1886-1891 – a campaign of boycott and refusal to pay rent to absentee and rack-rent brutal landlords. The pope had no damn business condemning that struggle for justice. Quadragessimo Anno was also the first papal document to introduce another key term: “solidarity.” Catholic thinkers adopted this term from labor unions to distinguish Catholic social theory from the then modern theories of extreme liberal/unbridled capitalism on the one hand, and materialistic communism on the other hand. Both were seen by the church to be disconnected from God and from God’s law. Pope John Paul II, of course, would make the term solidarity a most prominent principle of Catholic social teach- ing. For example, in his great 1981 Encyclical, Laborem exercens (“On Human Work”) he mentions solidarity ten times, no doubt, thereby, sending his blessing to the Solidarity movement in his native Poland. Solidarity is also, of course, the lifeblood and driving force of the AFL- CIO, with which I am honored to be associated, in my earlier work on the MacBride Principles and now as chief judge of the World Peace Prize Awarding Council. Current President of the AFL-CIO, the great Richard L. Trumka, ardently believes that peace is the fruit of solidarity, nationally and globally, and that is why we honored him with the World Peace Prize. Until Pope John XXIII and Vatican II (1962-65), Catholic social teaching was mainly based on natural law rather than on scripture. However, that had the benefit of being able to communicate with people of no faith and of all faiths. But, of course, the origins of this teaching were always scriptural, based on the Hebrew prophets who announced God’s special love for the poor and oppressed and based especially on the words and actions of Jesus Christ, who identified Himself completely with “the least of our brothers and sisters,’ not with the rich, the famous and the powerful. Pope John moved the church’s social teaching away from a rigid interpretation of natural law to “a reading of the sign of the times” making it more scripturally based. This highlighted the point that Biblical justice is not cold-hearted legal justice, but a matter of the heart that heeds the cry of the poor, as personified by Jesus Christ. Pope Paul VI, in his pivotal encyclical, would further powerfully place social justice teaching at the very heart of the Gospel (thereby endorsing the document, Justice in the World). He declared: “As the main point and the very center of his Good News, Christ proclaims salvation; this is the great gift of God which is liberation from everything that oppresses people, particularly liberation from sin and the Evil One…” (Evangelii Nuntiandi, par. 9, December 8, 1975).